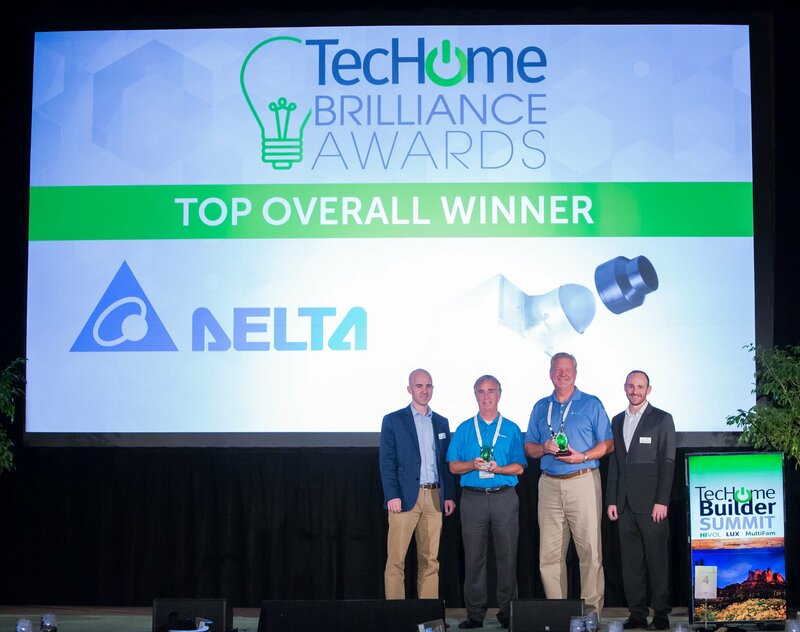 Delta Products’ multifunctional fan earned the Best Overall TecHome Brilliance Award at the TecHome Builder Summit in December. At the 2017 TecHome Builder Summit, the TecHome Brilliance Awards were presented to companies that were deemed to be best accelerating the application of residential technologies. In total, 21 products and communities were recognized for their innovations. A panel of builders who are well-versed in technology served as judges for the Awards, rating each entry in categories including features and function, homeowner benefits and unique advantages for builders and contractors. Among the winners of all the individual categories, one was chosen as the Best Overall. 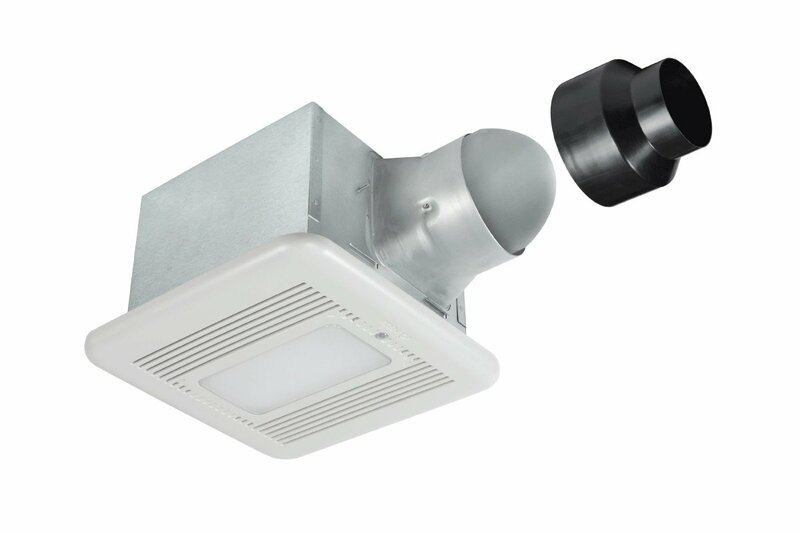 That was Delta Products’ BreezSignature SIG80-110MHLED 80/110 CFM Fan/Dimmable LED Light & Night-light with Humidity & Motion Sensors. It’s part of Delta’s signature line of high-end products, and includes a dimmable LED light, built-in motion sensor and built-in humidity sensor. It’s also extremely quiet, operating at just 0.3 sones. Not only is the multifunctionality of the device something homeowners love, but there are benefits for builders, too. Because it can be used as an 80 CFM fan or a 110 CFM fan, it cuts down on the number of SKUs wholesalers and contractors have to carry. 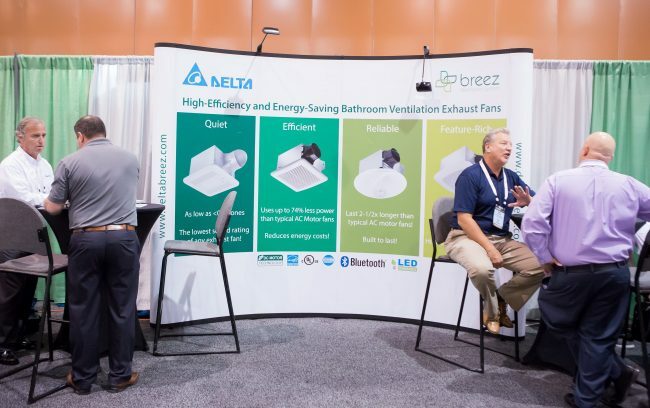 All these features made it the judges’ collective pick as the top overall product, in addition to winning the award in the Air Filtration and Cleaning Systems category. The entire Delta Products Corporation was so proud of being recognized by industry peers, the announcement of the win and photos were included in the company’s newsletter that is distributed to all 88,000 employees around the globe. Not only did the entire company appreciate the accolade, but guests at the TecHome Builder Summit did as well. The honor earned Delta increased interest from builders who were curious about what this award-winning fan could do for them. Delta’s John McGonagle and Boyd Sheets (second from right) accept their TecHome Brilliance Awards. Sheets and the Delta team continue to use the Brilliance Award to illustrate the quality of the fan. They use photos and information about the award while out promoting their products. For Sheets, the award also gives him a personal sense of pride. He has been with Delta since the fan division was launched. Recognition like this gives credence to what he and the company have been developing for nearly a decade and lets him know they are doing the right thing. As that line continues to expand, Sheets and the Delta team hope more TecHome Brilliance Awards also are in its future.